In reading the articles submitted for publication in this first issue of the Depth Psychology Alliance’s peer-reviewed online journal, I was reminded of the multi-disciplinary breadth of our collaborative “Depth” vision. The selection process was very challenging and would have been impossible without the care given to each submission by the selection committee. The articles in this issue draw from and penetrate into history, myth, ancient and modern culture, ecology, occult arts, and analytical psychology. My hope is that their publication stirs dialogue both within readers and among participants on the Alliance website, contributing to a exploratory conversation that both deepens and extends the edges of our vision and work. In a world that seems to change dramatically by the day, I am more compelled than ever to appreciate the depths that are available to those of us who take the time to regard them. When I see the shallowness, corruption, destruction, loss, helplessness, and suffering continuously conveyed from all sides by media (which is more and more pervasive while less and less conscious of the repercussions when they are neither compassionate nor thorough in their research), I find it easy to fall into despair. The state of the world, the increasing spate of natural disasters including tornados, flooding, earthquakes, and drought, the turmoil in war-torn countries, the starving human beings around the world and in Africa in particular, profoundly affect me and make me wonder at the meaning of being here in this world at this time. At the same time, I am uniquely aware that when I first discovered Depth Psychology just a few years ago, my life was transformed. I am deeply indebted to the works of Freud, Jung, Wolfgang Giegerich, Erich Neumann, James Hillman, Marion Woodman, Thomas Moore, and so many others who have shared their ideas. I feel completely aligned in my work when I remember to always look for the message the 212Unconscious is trying to send through when things don’t go as planned or a dream temporarily shakes me from oblivion. The Unconscious is constantly at work through symbols, dreams, myth, and nature and it is our job to interpret it, translate its message, and apply it in our lives to bring greater depths of experience, and more profound joy and meaning. Meanwhile, I am deeply grateful for the ability to pursue Depth Psychology as a calling and career, and this publication is a significant step in helping bring depth psych out into the world where others may benefit as well. It would never have happened without Rebecca Livingston Pottenger, who took over the editing process with tremendous expertise and ease when I floundered completely under the weight of the undertaking, nor without the committee of ten wonderful people who stepped up to become the reading and selection committee whose names appear at left. It all clearly exhibits the tremendous power of community as well as the power we each have to contribute to something where the ultimate outcome is far greater than the sum of the parts. Moving forward, Depth Insights will continue as a semi-annual e-zine for the near future, relying on the goodwill of others to bring it to wholeness and help all of us gain insight into the soul of the world. On that note, just a word of explanation for the title and the bee that appears as a connecting symbol. Many of you know that bees have a special place in my heart since I completed my Master’s thesis on the symbolism of Colony Collapse Disorder, the mass vanishing of the honeybees on a global level. What you may not know is that bees have five eyes, two of which are made up of over six thousand hexagonally shaped lenses each, giving them what must be god-like vision that makes that of mere mortals pale by comparison. The ability to see, to regard on multiple levels of dimension is the gift and promise if of using a depth psychological lens to understand ourselves and our relation to the world around us. Thus, Depth Insights offers each of us the opportunity to see through, beneath, between, and beyond what is at the surface to achieve new perspectives for learning, integration, transformation, and growth. I invite each of you to actively engage with the Unconscious and heed the call to share your insights will the global community-particularly on Depth Psychology Alliance (www.depthpsychologyalliance.com )–but also wherever and whenever the opportunity arises. As C.G. Jung said, “As far as we can discern, the sole purpose of human existence is to kindle a light in the darkness of mere being.” Each of us can work toward that objective simply by heeding the call to authentically reach out and join together in an ongoing search for consciousness and individuation. It is my fervent hope that we all will take to heart Jung’s missive and kindle our individual lights into a glowing, brilliant sun that will light the world to greater consciousness and joy. Bonnie Bright is the founder of Depth Psychology Alliance, the world’s first online community for Depth Psychology. She has an M.A. 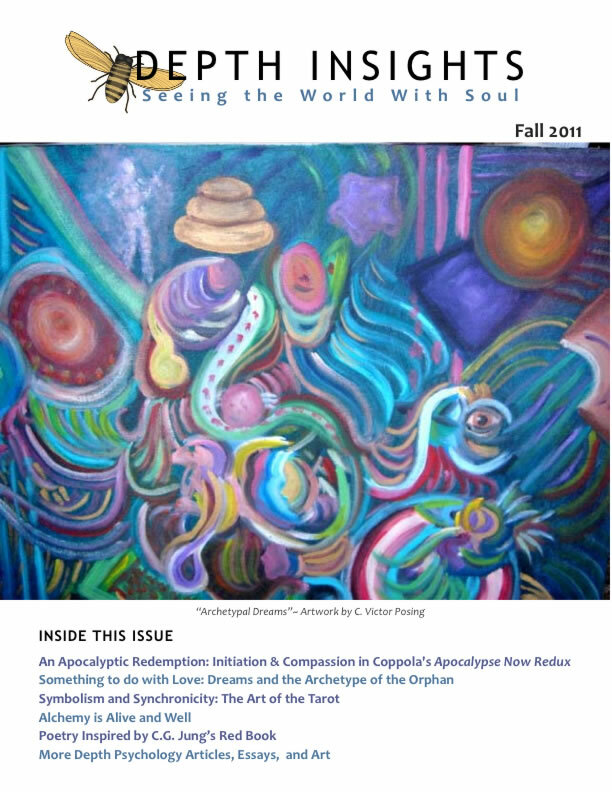 in Psychology from Sonoma State University and in Depth Psychology from Pacifica Graduate Institute where she is also completing a Ph.D..Her work, The Power of Story and Place among the Navajo in Canyon de Chelly appears in this issue.